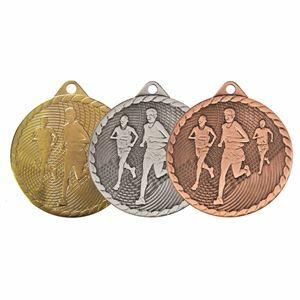 At Impact Trophies & Medals, we offer a fantastic selection of embossed medals suited to any kind of running event. 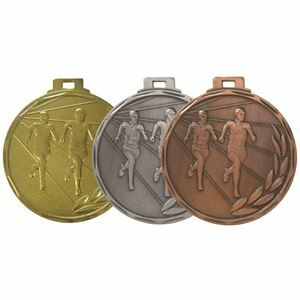 Our extensive range features embossed medals for marathons, fun runs, 5K, 10K and endurance running. 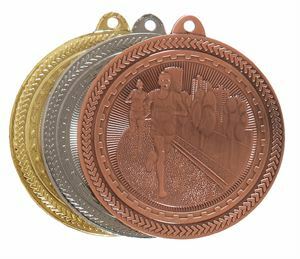 Impact Trophies & Medals are a leading retailers of embossed running medals, offering gold, silver and bronze medals for any budget. Great for personalisation, many of our running medals are available with a choice of coloured or patterned medal ribbon as well as optional printed text labels for the reverse of each medal, personalising it to your event or presentation needs. 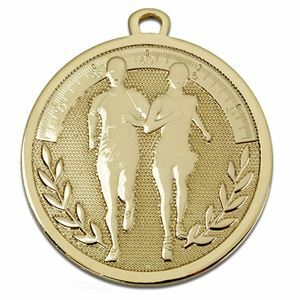 The Super Value Running Medal is embossed with two runners on a backdrop of trees and buildings. The medal has a chevron and grove pattern. An excellent value for money option. 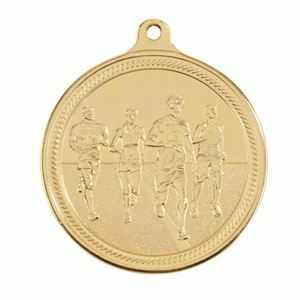 On a backdrop of isoline grid lines and with a decorative border, the medal is embossed with an image of three runners. 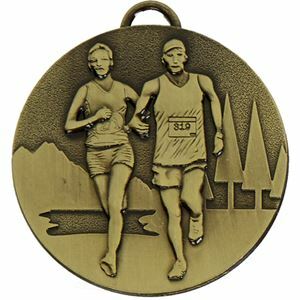 The Isoline Economy Running Medal offers excellent value for money. 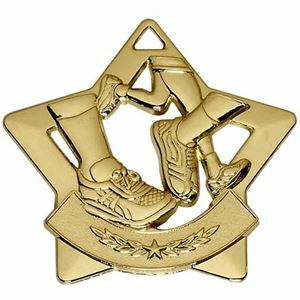 The Mini Star Running Medal is die-cast into a star shape and features athletes running legs and shoes with embossed detailing. There is a banner with a mini star and laurel leaves. Due to the open design of this medal, we are unable to offer personalised text labels or engraving on this product. An attached FREE red, white and blue ribbon is provided. 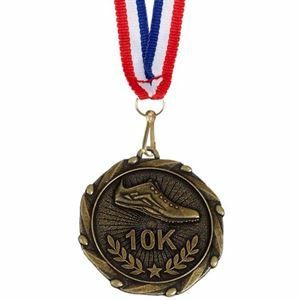 The Combo 10K Run Medal displays an embossed image of a running shoe, laurel leaves and 10K. The Combo Fun Run Medal offers great value as it is supplied with an attached red, white and blue ribbon. 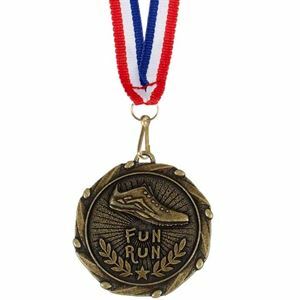 The medal has an embossed running shoe, laurel leaves and the wording FUN RUN. 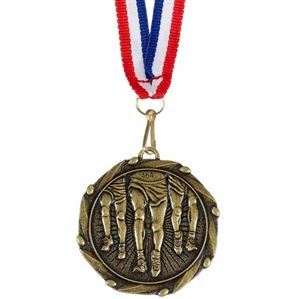 The Combo Runner Legs Medal features an intricate embossed image of three runners' legs. This medal offers great value as it includes a FREE red, white and blue ribbon. The Combo Running Shoe Medal includes a FREE red, white and blue ribbon. 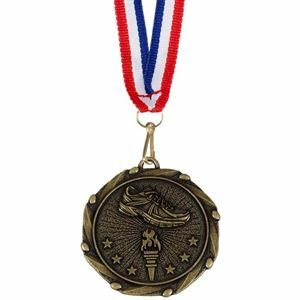 An embossed running shoe, lit victory torch and decorative stars are embossed onto the antique golden medal.